The spices that flavor Lebanese cuisine all line up behind za’atar, the leader of the pack. This blend of dried thyme, sumac, and sesame seeds tastes of bold, citrus notes. Thyme gives za’atar its green color, sesame its toasty nuttiness, the sumac its sourness (but I mean that with affection). For me, as I suspect for many, za’atar was an acquired taste, but like many acquired tastes—raw oysters, bleu cheese, scotch on the rocks—the acquisition is well worth having and keeping. The taste opens my mind’s eye to the Lebanon I have never met, tying me to a sense of the place, and to myself, in ways that photos, stories, or the news never could. Za’atar combined with olive oil makes a topping for savory rounds of thick Lebanese bread, typically eaten for breakfast. I have been on a quest to understand, bake, and of course to eat za’atar talami, or menoushe. It is sublime, and we’ll bake this together in the coming months. You can find za’atar at Middle Eastern grocery stores and many other supermarkets, or online here. Look for bags of 1 pound or larger rather than the small spice jars of green za’atar–they’re much more reasonably priced. It’s also possible to make your own za’atar by carefully roasting fresh thyme (or purchasing dried thyme), toasting sesame seeds, and mixing them with sumac and some coarse salt. 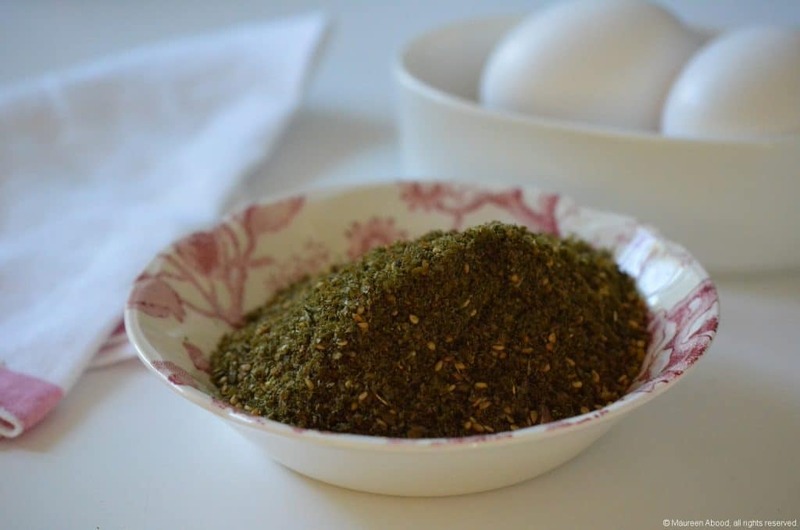 This week we’ll use za’atar very simply and deliciously … for breakfast. Tomorrow: the best fried eggs you’ve ever had. 10 Responses to "Ingredient: Za’atar"
We had zaatar at the breakfast table (mixed with olive oil) and from as far back as I remember, would dip a piece of bread in it after dipping into the labneh! It’s so great that you’re writing about za’atar right now! I found a recipe that sounds so good for za’atar chicken that I’m going to try tonight. Unfortunately the only za’atar that I have isn’t quite as good as this one looks. I need to find where I can get less than a 2 lb bag around where I live. I have sumac, thyme, sesame seeds, and coarse salt at home, so I’d like to try making my own. Should I mix everything in a 1:1 ratio? Thanks! I”ll give it a shot soon. 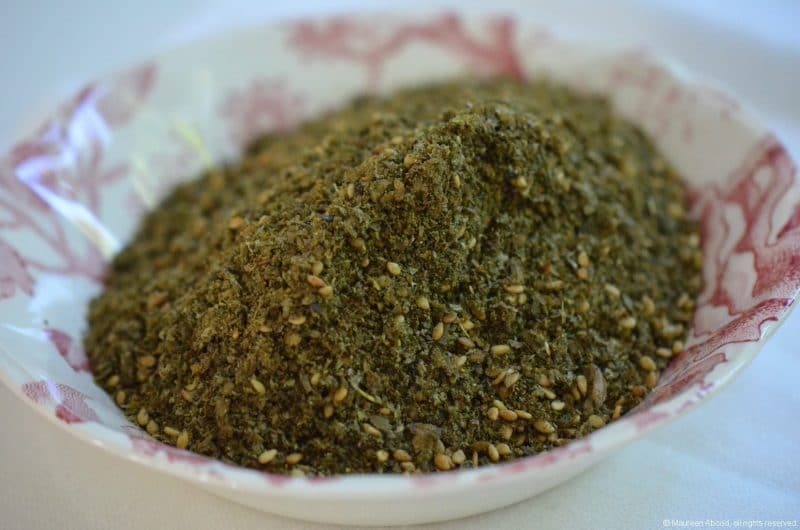 Your za’atar looks more green than mine, did I make a mistake? I did a ratio of 1:1 except for the salt. I used dry thyme leaves. Should I have ground them first. Julie, maybe the thyme is a different variety? Nice that you are mixing your own!! wow, I am glad that you all know about za’atar, I had some this morning for breakfast with Italian bread and sweet hot tea, I dip the bread in Olive oil and then dip it in za’atar, taste great with hot tea. Sorry I dropped my cheerios with milk and heart of palms and it got into the keyboard and they are sticky even though I cleaned it, but hence the above mess. Can I have ingreidents of sumac too. Lilliana, that’s funny! Za’atar is a blend of sumac, sesame seeds, and wild thyme (I find only imported Lebanese wild time imparts the classic za’atar flavor). Sumac is a powder made from the sumac berry, and it is the only ingredient other than sometimes salt in sumac.